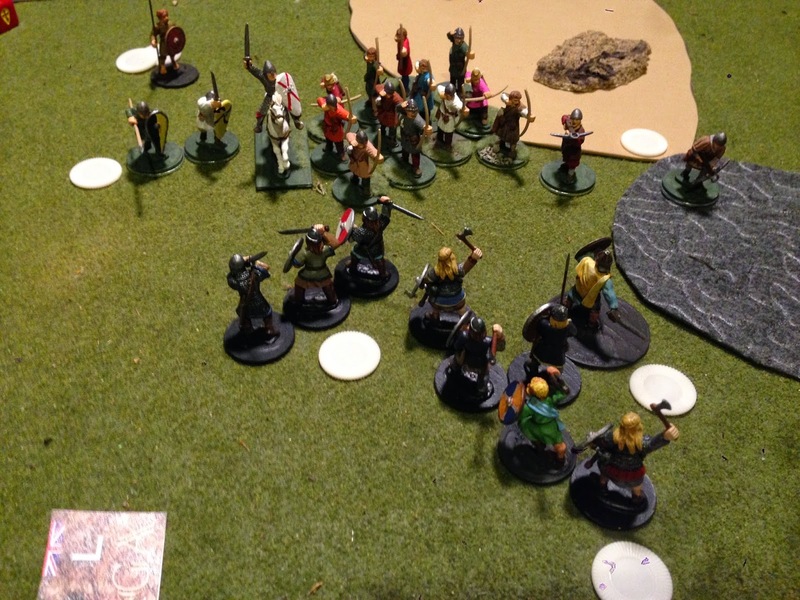 The Dane's warlord (aka Cloudbeard, Kim, &, in spirit, Leo) directed a unit of hearthguard with all favorable dice on the battleboard to take down the Norman warlord. There were tense moments of rule reading by the Normans with intent on unhinging the Dane's psyche. When rules were read and positions measured the dice were gathered -- 12 dice for hearthguard and the 5 for the warlord -- and were rolled. The warlord was hit 5 times and now needed 4 saving throws to stay on the field of battle. Only one hit was countered. The Norman warlord, majestic on his white horse let go his shield, glowered at the unbelievers, and fell to ground dead.